In recent times, scientists have discovered that there are particular “short-wavelength light emissions” that can wreak havoc on the brain. Specifically, blue-enriched lights are problematic because of their stimulating properties. During the day, they serve an important purpose – to keep us alert and energized. But, if you’re flooded with an unnatural amount of blue wavelengths close to bedtime, your mental state and sleep quality is likely to suffer. 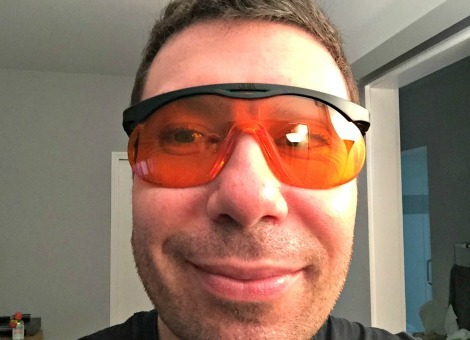 Fortunately, there is a simple way to protect yourself from inappropriate light exposure at night: wear amber or blue-blocking glasses. Here’s a picture of me wearing my pair. I recommend and use this affordable product, as does Consumer Reports where it tested well earlier this year. In the medical literature, there are many accounts of bright lights negatively affecting sleep quality. Exposure to light-emitting devices causes a significant reduction in melatonin production. In our brain, the pineal gland releases melatonin aka “the sleep hormone” when we retire at night in a dark setting. Without enough melatonin, sleep quality suffers. Additionally, melatonin is a potent antioxidant, which may confer protection against a variety of cancers. By filtering out the more stimulating spectrum of (blue) light, researchers have found that various populations (delayed sleep disorder patients, “healthy adults”, nightshift workers and teenagers) find substantial benefits in relation to sleep satisfaction. The key is to wear the amber glasses for about three hours prior to bedtime. Rest assured, you can still engage in all of your typical activities. You’ll simply be seeing everything through amber tinted glasses. Frequently, those using blue-blocking glasses notice a calming effect long before they actually fall asleep. These anecdotal reports are supported by a relatively new line of study: using “blue light blockades” to reduce mania in those with bipolar disorder. The therapeutic use of darkness as a mood stabilizer has been noted for quite some time. A case report from 2014 and a controlled study from 2016 now reveal that amber glasses effectively and safely function as an add-on treatment for bipolar patients in manic states. The conclusion of the case report stated, “The unusually rapid decline in symptoms, accompanied by uniform sleep parameter changes markedly increased regularity, suggest that blue-blockers might be targeting a central mechanism in the pathophysiology of mania”. This is very promising indeed and begs for additional scientific inquiries. The brain is not the only organ conditionally affected by bright light. The essential and harmful effects of short-wavelength blue light enter the body via the eyes. Therefore, it should come as little surprise that this part of the light spectrum can influence ocular function and health. Current trials, published in peer reviewed journals, reveal that shielding eyes from excessive blue light may protect against age-related macular degeneration, eye fatigue and poor visual acuity caused by dry eye. In essence, this suggests that wearing eye protection at night may serve a similar purpose as wearing sunglasses in the daytime. OBJECTIVE: To objectively and subjectively compare whether reading a story for 30 min from an iPad or from a book in bed prior to sleep will differentially affect sleep. METHODS: Sixteen students (12 females, mean age 25.1 ± 2.9 years) underwent ambulatory (sleeping in their own beds at home) polysomnographic (PSG) recordings in a counterbalanced crossover design consisting of three PSG nights (one adaptation night, two test nights) and two different reading materials: read from an iPad or from a book. Illumination was measured during reading and Karolinska Sleepiness Scale was completed prior to turning the light off. Sleep diaries were kept to assess subjective sleep parameters from day to day. RESULTS: Illumination was higher in the iPad condition compared to the book condition (58.3 ± 6.9 vs 26.7 ± 8.0 lux, p <0.001). Reading a story from an iPad decreased subjective sleepiness, delayed the EEG dynamics of slow wave activity by approximately 30 min, and reduced slow wave activity after sleep onset compared to reading from a book. No parameters of sleep state timing and sleep onset latency differed between the two reading conditions. CONCLUSION: Although there was no direct effect on time spent in different sleep states and self-reported sleep onset latency, the use of an iPad which emits blue enriched light impinges acutely on sleepiness and EEG characteristics of sleep pressure. Hence, the use of commercially available tablets may have consequences in terms of alertness, circadian physiology, and sleep. J Biol Rhythms. 2016 Jul 22. Short Blue Light Pulses (30 Min) in the Morning Support a Sleep-Advancing Protocol in a Home Setting. Many people in our modern civilized society sleep later on free days compared to work days. This discrepancy in sleep timing will lead to so-called ‘social jetlag’ on work days with negative consequences for performance and health. Light therapy in the morning is often proposed as the most effective method to advance the circadian rhythm and sleep phase. However, most studies focus on direct effects on the circadian system and not on posttreatment effects on sleep phase and sleep integrity. 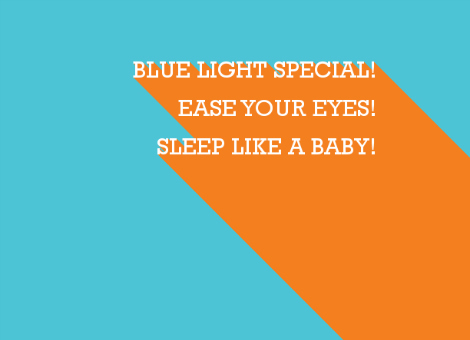 In this placebo-controlled home study we investigated if blue light, rather than amber light therapy, can phase shift the sleep phase along with the circadian rhythm with preservation of sleep integrity and performance. We selected 42 participants who suffered from ‘social jetlag’ on workdays. Participants were randomly assigned to either high-intensity blue light exposure or amber light exposure (placebo) with similar photopic illuminance. The protocol consisted of 14 baseline days without sleep restrictions, 9 treatment days with either 30-min blue light pulses or 30-min amber light pulses in the morning along with a sleep advancing scheme and 7 posttreatment days without sleep restrictions. Melatonin samples were taken at days 1, 7, 14 (baseline), day 23 (effect treatment), and day 30 (posttreatment). Light exposure was recorded continuously. Sleep was monitored through actigraphy. Performance was measured with a reaction time task. As expected, the phase advance of the melatonin rhythm from day 14 to day 23 was significantly larger in the blue light exposure group, compared to the amber light group (84 min ± 51 (SD) and 48 min ± 47 (SD) respectively; t36 = 2.23, p < 0.05). Wake-up time during the posttreatment days was slightly earlier compared to baseline in the blue light group compared to slightly later in the amber light group (-21 min ± 33 (SD) and +12 min ± 33 (SD) respectively; F1,35 = 9.20, p < 0.01). The number of sleep bouts was significantly higher in the amber light group compared to the blue light group during sleep in the treatment period (F1,32 = 4.40, p < 0.05). Performance was significantly worse compared to baseline at all times during (F1,13 = 10.1, p < 0.01) and after amber light treatment (F1,13 = 17.1, p < 0.01), while only in the morning during posttreatment in the blue light condition (F1,10 = 9.8, p < 0.05). The data support the conclusion that blue light was able to compensate for the sleep integrity reduction and to a large extent for the performance decrement that was observed in the amber light condition, both probably as a consequence of the advancing sleep schedule. This study shows that blue light therapy in the morning, applied in a home setting, supports a sleep advancing protocol by phase advancing the circadian rhythm as well as sleep timing. Chronobiol Int. 2016 Aug 5:1-13. Despite widely published speculation regarding a potential potency advantage of short-wavelength (blue-appearing) light for Seasonal Affective Disorder (SAD) treatment, there have been few systematic studies. 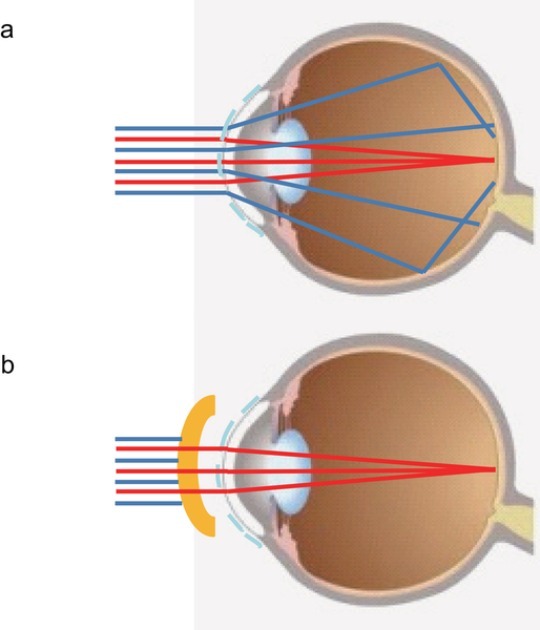 Those comparing short-wavelength to broad-wavelength (white) light under actual clinical conditions suggest equivalent effectiveness. This multicenter, parallel-group design trial was undertaken to compare the effects of light therapy on SAD using blue (~465 nm) versus blue-free (595-612 nm) LED lights. Fifty-six medication-free subjects aged 21-64 years who met DSM-IV-TR criteria for recurrent major depression with winter-type seasonal pattern were enrolled in this blinded study at five participating centers between January and March 2012. Thirty-five subjects met the criteria for randomization to 30 min of either blue (~465 nm) or blue-free (595-612 nm) daily morning light therapy. Twenty-nine subjects completed the study; three subjects withdrew due to treatment-related adverse events, including migraines, and three withdrew for non-study-related reasons. The primary effectiveness variable was depression score (SIGH-ADS) after six weeks of daily light treatment. Secondary effectiveness variables included quality-of-life (QoL) and suicidality ratings. Using an intent-to-treat analysis, mean depression scores were different at baseline for the blue group (29 ± 5 versus 26 ± 5, p = 0.05 blue versus blue-free, respectively), and the initial score was used as a covariate. Baseline scores were not significantly different between treatment groups among those who completed the study, and no significant differences in depression scores were observed after 6 weeks (mean ± SD scores at 6 weeks: 5.6 ± 6.1 versus 4.5 ± 5.3, p = 0.74, blue versus blue-free, respectively). In addition, the proportion of subjects who met remission criteria, defined as a depression score ≤8, was not significantly different between the two groups (p = 0.41); among the 29 subjects who completed the study, 76% of subjects experienced remission by the end of the trial, which coincided with the beginning of spring. The QoL and suicidality ratings were also significantly improved from pre- to post-treatment, with no significant difference between treatments. No subject experienced worsening or non-improved symptoms over the 6-week trial. The main finding of this study is that subjects treated with blue light did not improve more than subjects treated with blue-free light; both showed substantial improvement on multiple measures. Failure to find differences may have resulted from methodological constraints, including a small sample size. Recruitment began mid-winter during an unusually mild season, and the trial was terminated earlier than planned by the study sponsor due to a failure to detect a difference. However, if confirmed in a larger randomized sample, these results suggest that blue wavelengths are not necessary for successful SAD treatment. Sleep Med. 2016 Jul 25. BACKGROUND: The use of electronic devices emitting blue light during evening hours has been associated with sleep disturbances in humans, possibly due to the blue light-mediated suppression of the sleep-promoting hormone melatonin. However, experimental results have been mixed. The present study therefore sought to investigate if reading on a self-luminous tablet during evening hours would alter sleepiness, melatonin secretion, nocturnal sleep, as well as electroencephalographic power spectral density during early slow-wave sleep. METHODS: Following a constant bright light exposure over 6.5 hours (~569 lux), 14 participants (six females) read a novel either on a tablet or as physical book for two hours (21:00-23:00). Evening concentrations of saliva melatonin were repeatedly measured. Sleep (23:15-07:15) was recorded by polysomnography. Sleepiness was assessed before and after nocturnal sleep. About one week later, experiments were repeated; participants who had read the novel on a tablet in the first experimental session continued reading the same novel in the physical book, and vice versa. RESULTS: There were no differences in sleep parameters and pre-sleep saliva melatonin levels between the tablet reading and physical book reading conditions. CONCLUSIONS: Bright light exposure during daytime has previously been shown to abolish the inhibitory effects of evening light stimulus on melatonin secretion. Our results could therefore suggest that exposure to bright light during the day – as in the present study – may help combat sleep disturbances associated with the evening use of electronic devices emitting blue light. However, this needs to be validated by future studies with larger sample populations. Melatonin suppression and sleepiness in children exposed to blue-enriched white LED lighting at night. Light-induced melatonin suppression in children is reported to be more sensitive to white light at night than that in adults; however, it is unclear whether it depends on spectral distribution of lighting. In this study, we investigated the effects of different color temperatures of LED lighting on children’s melatonin secretion during the night. Twenty-two healthy children (8.9 ± 2.2 years old) and 20 adults (41.7 ± 4.4 years old) participated in this study. A between-subjects design with four combinations, including two age groups (adults and children) and the two color temperature conditions (3000 K and 6200 K), was used. The experiment was conducted for two consecutive nights. On the first night, saliva samples were collected every hour under a dim light condition (<30 lx). On the second night, the participants were exposed to either color temperature condition. Melatonin suppression in children was greater than that in adults at both 3000 K and 6200 K condition. The 6200 K condition resulted in greater melatonin suppression than did the 3000 K condition in children (P < 0.05) but not in adults. Subjective sleepiness in children exposed to 6200 K light was significantly lower than that in children exposed to 3000 K light. In children, blue-enriched LED lighting has a greater impact on melatonin suppression and it inhibits the increase in sleepiness during night. Light with a low color temperature is recommended at night, particularly for children’s sleep and circadian rhythm.